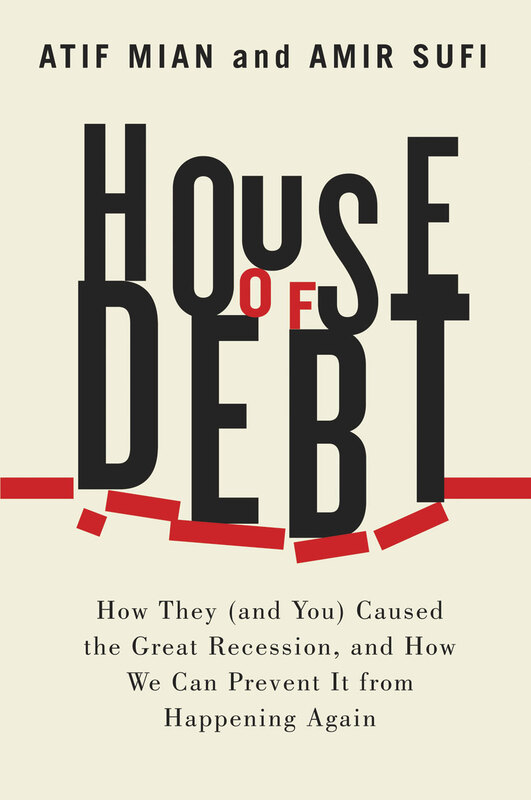 I just read House of Debt, the latest book by Mian and Sufi, which got a relatively wide coverage in the media, so I thought I should write a quick post about it. Overall, it’s a good book, accessible for those who do not have a background in economics or finance. What I particularly liked about the book is its emphasis on leverage. The boom in household and business leverage over the past two decades inevitably fuelled an unsustainable boom in aggregate spending. Bringing indebtedness back to more ‘normal’ values also inevitably reduces spending power*. Yet, too many economists seem to take this pre-crisis trend as normal. They are also right to advocate letting banks fail, as well as question the non-monetary banking intermediation channel (as proposed by Bernanke in his famous article Non-Monetary Effects of the Financial Crisis in the Propagation of the Great Depression) and the effectiveness of monetary policy following a debt boom. However, the authors never explain the underlying causes of the leverage boom and the crisis. It seems to be assumed that financial innovations (i.e. securitization mostly) appear all of a sudden, enabling an unsustainable boom to take place. What role did monetary policy play during the period? Or banking regulation? Those questions remain unanswered. Yet, as I’ve been explaining for now close to a year, the combination of those two factors was critical in triggering the boom in financial innovation, leverage, and malinvestments. I wish Mian and Sufi had provided their thoughts on that topic in their book. They provide evidence that house prices increased the most in counties with inelastic housing supply. Still, they also strongly increased in those with elastic housing supply… They focus on the Asian ‘savings glut’, which would have flowed into the US. Perhaps, but it doesn’t mean that the Fed rate wasn’t too low, and many countries all around the world also experienced booming housing markets. Moreover, mortgage delinquencies started when the Fed increased its base rate… Despite being a US-centric book, there is also no discussion of the particular populist political framework at play in designing both the peculiar US banking system and the crisis, as described by Calomiris and Haber. As a result, they seem to identify the rise in securitization as a fraud. I believe this is not the case. Banks started holding securitized assets on their balance sheet because of their beneficial capital treatment. There is little sign that they tried to originate bad assets to defraud naïve investors. 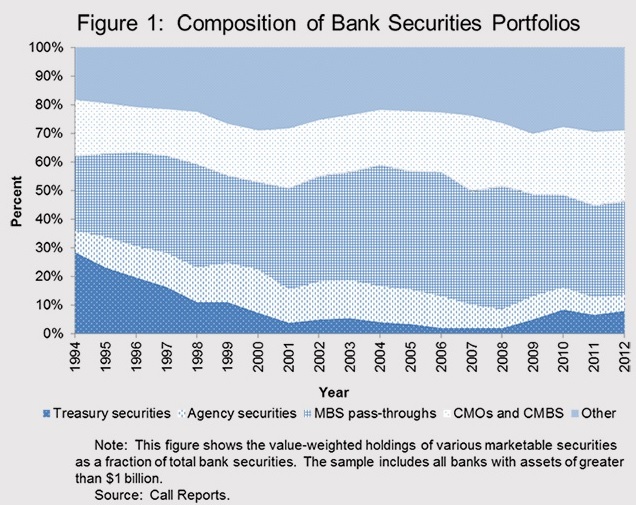 Indeed, take a look at the chart below (from a recent post): banks also invested in such products and self-retained tranches of those they had originated throughout the boom period, and continue to do so. This points to ignorance of the risks. Not fraud. I encourage you to read the book for its very good data gathering. Despite some of its (relatively minor) flaws, the book does much to debunk some myths through the appropriate use of empirical evidence. * This doesn’t mean that there wasn’t also an excess demand for money at that time. Just that a decreased money supply through debt deflation exacerbated the problem.